I'm not continuing on from my last post about my daughter's food sensitivities and leaky gut. Today. Got Baba in visiting and she says "she doesn't come here to watch me type on the computer". Don't want to tick off Baba now do I. So that story will have to continue another day. Probably Friday. But I did insist on doing a bit of "typing on that computer thingy" because I have to get this recipe documented before I lose my notes. That happens a lot around here. My daughters use my paper for crafts or coloring or my little guy just eats or slobbers on it. The GIRLS LOVED THIS GRANOLA. Yay. Happy dance. In an attempt to deal with said daughter's food sensitivities to wheat, dairy, eggs, yeast, cane sugar, etc, etc, etc I have been baking up a storm trying to figure out what to feed her. And I have had lots of "I don't like this - its gross" comments coming back at me. Its frustrating and expensive. Luckily hubby has guts of steel and can eat anything so he usually has no problems polishing "gross" stuff off. But today I finally made something that all three kids loved. 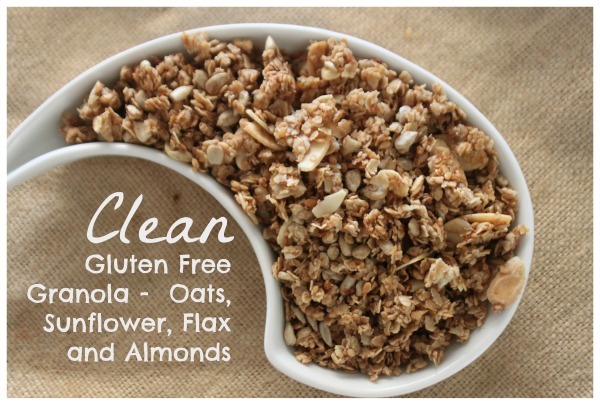 Clean Granola. I had been buying Ancient Grains granola from Costco but she can't have any of the wheat family grains anymore including amaranth or spelt. And it had added sugar. So I really needed to come up with a granola recipe she could eat. This was so EASY. I can't believe I didn't make this sooner. What kind of clean eating blogger am I anyway? Plus it is cheap to make. Much cheaper than buying it. I'm excited. I'd be more excited if I could have some but that's not in the cards for this Candida diet slave. So give it a try. This is by no means a low carb, Paleo or Candida recipe. But if you have kids that love granola and/or you can tolerate a bit of non-glutenous grains then give it a try. It was delicious (okay a few small pieces may have fell off the counter and landed in my mouth). Melt oil in microwave (on high for about 30 seconds). Add sugar, syrup and vanilla to oil and mix thoroughly. Add sugar mixture to dry ingredients slowly, mixing as you go. Spread granola on baking sheet. Bake for 10 minutes. Remove from oven and gently stir.